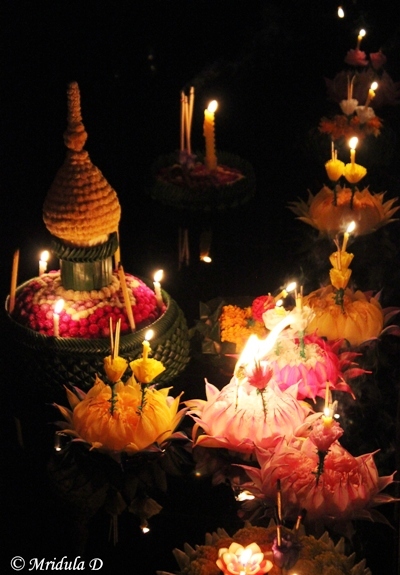 To me Loi Krathong festival looked like a festival of light and water. Like many other things in Asia there are many versions of what the festival means and how it started. One version is that it was started in the region of Sukhothai by a court lady called Nopphamat. Another version puts it as a Hindu festival later adapted by Buddhists. Yet another version says it is celebrated by people of Thailand as gratitude to the River Goddess. In true Asian spirits all these Loi Krathong histories can co-exist rather than contradict each-other. 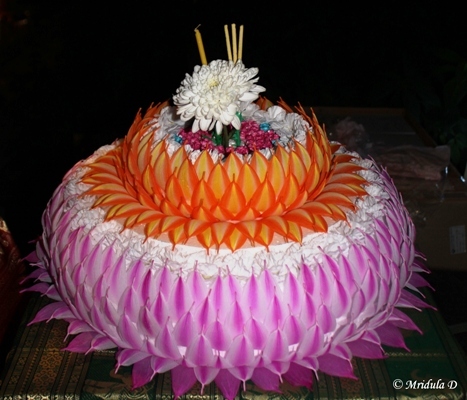 The beautiful float you see in the picture is known as Krathong. Loi I am told, means to float. 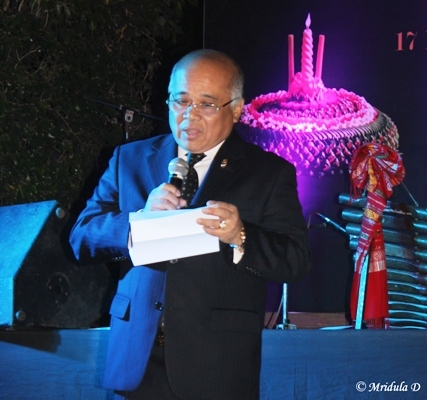 I attended the Loi Krathong Festival at Dusit Deverana, New Delhi (a new hotel) yesterday night. The festival started with dance performances from Thailand that were as usual colorful and graceful. I should have guessed it would be an outdoor event as it involved water. But I did not and I was wearing a sleeveless top. I had the sense to take a shawl though so I managed fine in the end! However, I was so engrossed in clicking pictures and enjoying the dances that I forgot the cold very soon. I liked the coconut shell dances the best for its foot tapping music and rhythm. It was so fast that in the night I did not manage to click one decent picture of it but I guess the video is better which I will upload soon. After this the Ambassador of Thailand to India gave a short speech. In his speech he mentioned both the Nopphamat and the River Goddess version of the festival. It was then time to light the Krathongs and float them in the water body of the Dusit Deverana hotel. But we also had the master Krathong coming with a ‘queen’ in a palanquin. Once the main krathong was received it was time for the festivities to start in the earnest. All the guests were given a Krathong to float and I too tried my hand at it. The festival was preceded by drinks and followed by dinner. I ate red Thai curry and my favorite fruits like Rambutan and Mangosteen once again. It was a beautiful evening, I managed to get a small flavor of Thailand in my own backyard at Dusit Deverana, Delhi.